I have one piece of advice above all others for anyone picking up The Corridor of Uncertainty, and that is not to be concerned about the first chapter. It doesn’t need to be there, and whilst I can see what author Nihar Suthar was probably trying to do, I don’t think it was ever going to work. But as I say don’t worry about it, as all it achieves in practical terms is to make the decision whether or not to give the book five star status just a tad easier. In the end I stopped short of giving The Corridor of Uncertainty our top award, but make no mistake this is a superb book and one that deserves to be widely read. In fact in that respect I think Pitch have missed a trick by their use of an Afghan batsman on the cover. The problem that causes is anyone chancing upon it is going to categorise The Corridor of Uncertainty as a cricket book, something that in many ways it isn’t and, to the extent it is, it resembles no cricket book I have ever read. And that is what is remarkable about The Corridor of Uncertainty. 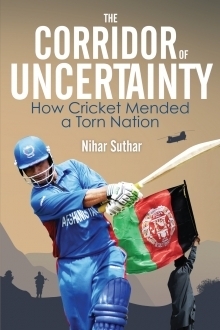 It is written like a novel, and Suthar enters the hearts and minds of the main protagonists in the development of Afghan cricket and the detail of the cricket itself has no place here. The reality is that a reader who knows next to nothing about the game will enjoy Suthar’s book. For example there is absolutely no reason why it would not appeal to every single one of the millions of readers who made The Kite Runner a best seller, as well as the rather more modest forty thousand or so who buy Wisden every April. In fact for that reason it has the potential to be the biggest selling book about the game of cricket ever written. The reader is given some background about the politics and recent history of Afghanistan, beginning with the Soviet occupation in 1979, and followed by the country’s civil war, but the nub of the book begins in 1992. Pakistan’s victory in that year’s World Cup inspired three young Afghan’s who were living hand to mouth in the Kacha Garhi refugee camp in Northern Pakistan. They, like the rest of their countrymen, had no previous knowledge of the game, but the final fired their imaginations. It is the passion of those three; Taj Malik, Raees Ahmadzai and Karim Sadiq, and the former in particular that is why Afghanistan’s cricketers enjoy the status they do today. The role of a fourth man, Allah Dad, both ally and rival to Malik, is crucial to the story as well. That the growth of cricket in Afghanistan is a story of triumph over adversity will come as no surprise to anyone, but just what barriers stood in the path of Malik and Dad would have drained the enthusiasm of most. I did know that the Taliban, during their time in power, encouraged the game. What I didn’t know was that initially that most brutal of regimes most certainly didn’t approve. Nor did I have any awareness of what their chosen use for the national sports stadium was. I also recall hearing that the Pakistan Board had extended a helping hand to their neighbours in terms of funding, provision of equipment and encouragement, but what I had no idea about was the tortuous journey Allah Dad had to undertake in order to make that possible. It was of course a trip that proved to be worth all the hardships Dad had to bear. What he needed to do was deliver an important letter to the PCB. The problem was the war torn country lacked a postal system, so Dad had to literally take his life in his own hands in order to hand deliver the document. As to results on the field there were a few setbacks, followed by the remarkable run of success that saw the Afghans rise so rapidly to ODI status in the latter part of the noughties. The victories are quite properly dealt with, but it is the earlier years that Suthar is primarily concerned with, and in recounting the story of those in the way he has he has produced the most thought provoking book on any subject I have read in years – and it has a happy ending too!